Centric relation is defined as maxillomandibular relationship, independent of tooth contact, in which the condyles articulate in the anterior superior position against the posterior slopes of the articular eminences; in this position, the mandible is restricted to a purely rotary movement; from this unstrained, physiologic, maxillomandibular relationship, the patient can make vertical, lateral, or protrusive movements; it is a clinically useful, repeatable reference position. It is the most important and critical relationship among all the intermaxillary relations because failure in its correct acquisition will cause disharmony in occlusion. The oral musculature remains passive during recording. Intraoral tracing is small and cannot be monitored during recording, this disadvantage of this tracing has led to popularity of extraoral method. In the present case report (Ref/dchamt/ethical/2011-2), authors have attempted to reduce this disadvantage by employing an intraoral digital tracer board connected to extraoral computer monitor, because of this, the intraoral tracing can be seen in real time on the computer screen and can be monitored. The system in principal consisted of three parts namely intraoral sensor pad, extraoral digitizer circuit MAX 232 and a computer display having an analysis software MATLAB® programme (MATLAB 7.11 R2010b). 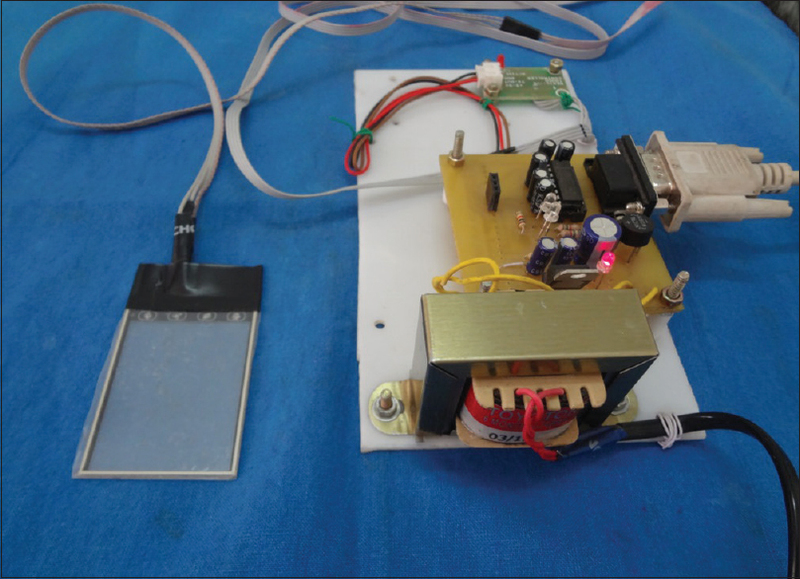 The sensor portion of digitizer works from oral cavity and functions as tracing board. The sensor portion is connected to digitizer control circuit located extraorally. A touchpad (2.5 cm × 3.5 cm in dimension; 8.9 g in weight) was selected for case having number of resistors in the form of X and Y dimension. 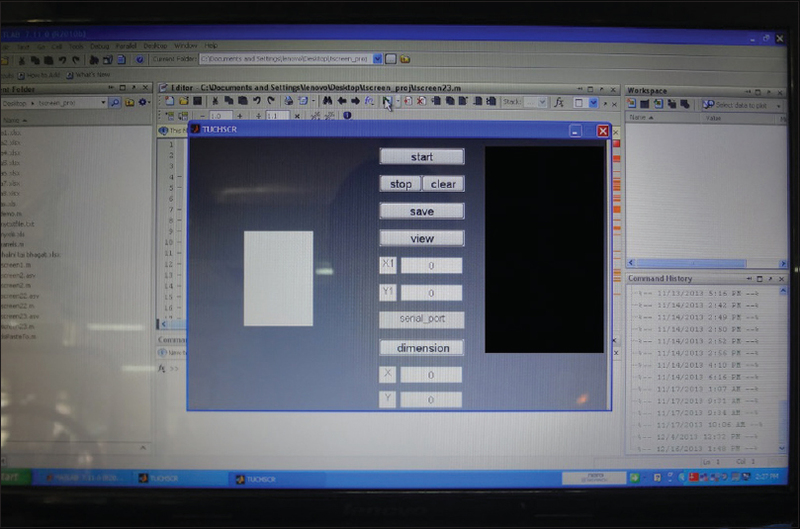 It was connected to analog screen of the microcontroller [Figure 1]. 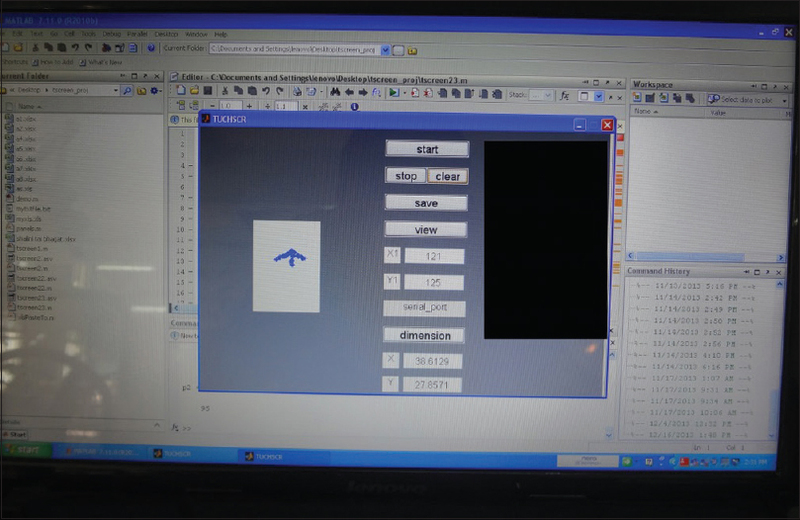 When stylus [Figure 2] travels the pad, analog to digital converter input of the microcontroller is sent to PC along with X and Y dimension. Microcontroller was not directly connected to computer or laptop. It causes voltage levels for which MAX 232 circuit [Figure 3] is used for level shifting. 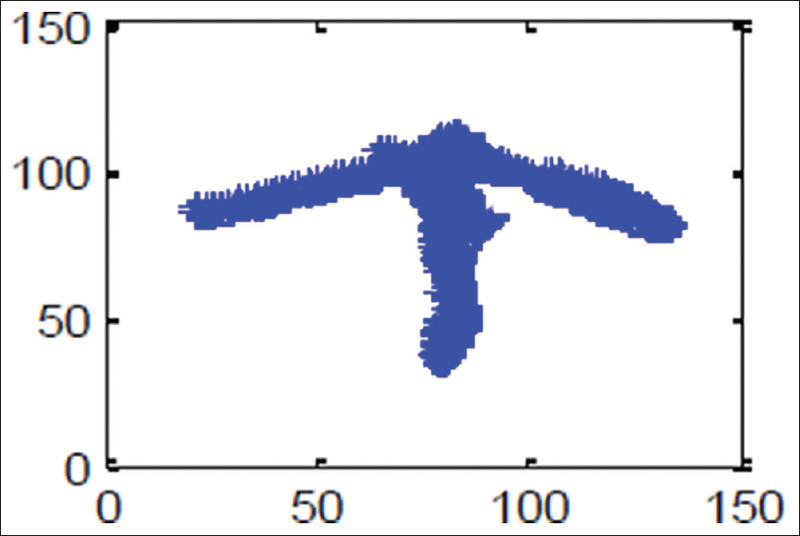 Computer/laptops port reads X and Y dimension and MATLAB®, a computing analysis software [Figure 4] shows the exact location of stylus pin. 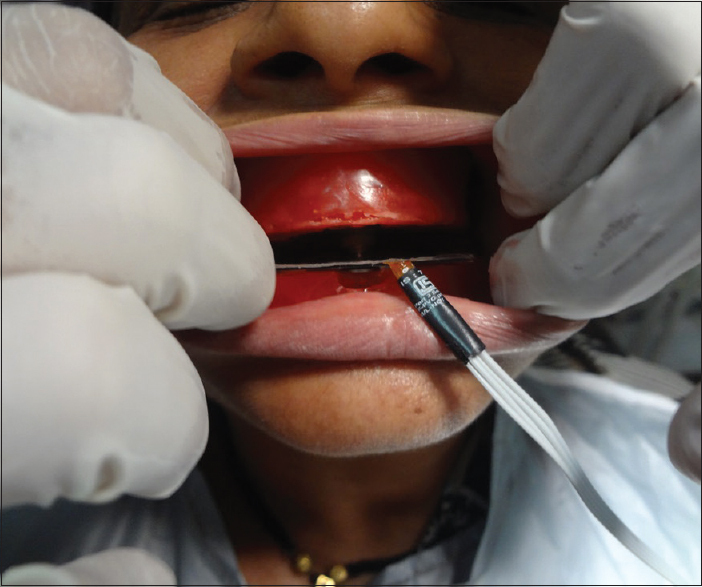 The tracer used in the study was made by modifying Height tracer (AVCO enterprises, Mumbai, Maharashtra, India) to intraoral use by reducing the dimension of stylus pin and by installing it with the central bearing device. Changes in Y coordinates represented movement in anteroposterior direction while changes in X co-ordinates were associated with lateral movement over tracing board. A tentative vertical jaw relation at rest was determined by combination of Niswonger method and by phonetics method. After confirming vertical dimension at rest, vertical dimension at occlusion (VDO) was calculated considering free-way space of 2–4 mm [Figure 5]. After vertical jaw relation maxillary central bearing device in the form of spring-loaded stylus was attached to occlusal rims and subsequently secured rigidly in modeling wax by green stick compound. The adjustment of central bearing device is done in such a way that stylus is fully compressed, and it is just slightly above the occlusal rim plane when both jaws are closed. Now, the tracing board in the form of touchpad was fixed permanently to the conventional mandibular central bearing device with adhesive resin. 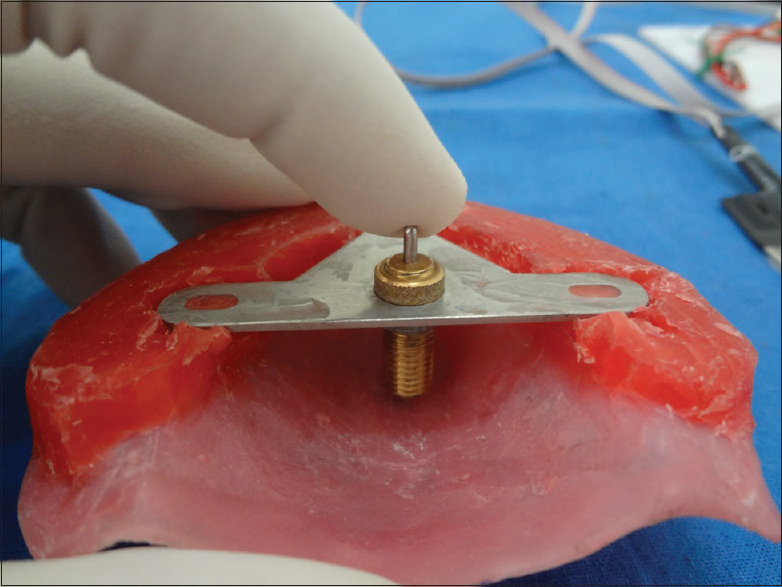 The lower central bearing device with tracing board in the form of touchpad is now placed over the wax occlusal rim in such a way that previously determined VDO is not disturbed. The height of mandibular occlusal rim is reduced to meet this requirement. After this, both the occlusal rims with their respective central bearing devices were placed in patient's mouth [Figure 6] and [Figure 7], and observations were made for VDO. After this, it was ensured that spring loaded stylus is completely compressed to maintain VDO when patient closes both jaw while some space is observed between the occlusal rims to ensure free movement of stylus over tracing pad without any obstruction or contact between opposing occlusal rims. 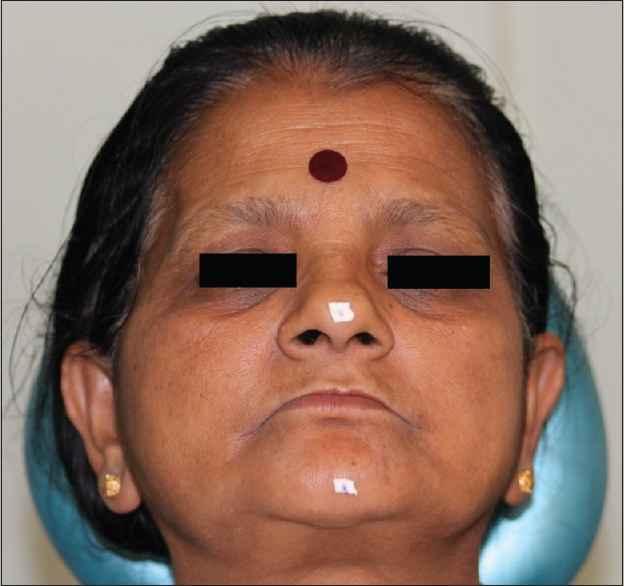 The patient was then instructed to move the mandible forward and back in the median line which gave the path of a straight protrusion. After this, the patient was instructed to retrude the mandible to its fullest extent and slide it one side and back again [Figure 8]. The form of tracing in the shape of arrowhead tracing was noted, and its X and Y coordinates were noted [Figure 9] and [Figure 10]. Interocclusal check records were taken with bite registration silicone (Virtual® CAD bite), and teeth arrangement was completed. The verification of centric jaw relation was done at the step of try in. The use of a digital screen for tracer board was first attempted by Watanabe in 1999 with an immovable stylus however we believe that better recording can be achieved using spring-loaded stylus as both the occlusal rims separate during protrusive movement due to the Christensen phenomenon. 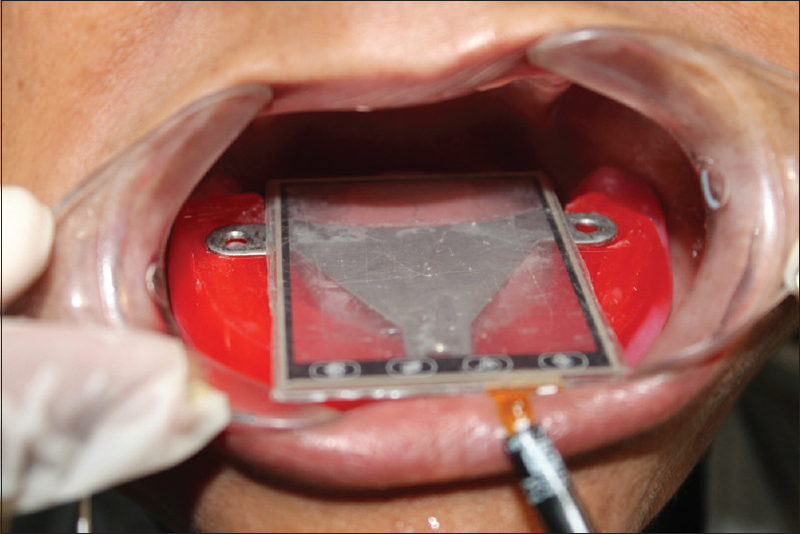 The intraoral sensor was made up of touchpad working on resistive technology. Comparison of different centric jaw relation methods for their reproducibility with each other, for example, Chin Point guidance method against Gothic arch tracing, etc. The comparison of different centric jaw relation methods for their maximum retrusion with each other. Use is contraindicated in patient with macroglossia, excessively resorbed ridges as it will compromise the stability of the central bearing device. Use is also contraindicated in patients with excessive biting forces and with poor neuromuscular control. Intraoral tracing is now more operator friendly and can now be monitored in real time. Niswonger JE. The rest position of the mandible and the centric relation. J Am Dent Assoc 1934;21:1572-82. Zarb GA, Bolender CL. Prosthodontic Treatment for Edentulous Patients. 12th ed. St Louis: Elsevier; 2005. p. 284. Gupta M. A comparative clinic-radiographic analysis of horizontal condylar guidance determined by height tracer, novel indigenous intraoral digi tracer and check bite in complete denture prosthesis. Int J Curr Res 2017;9:49940-6.